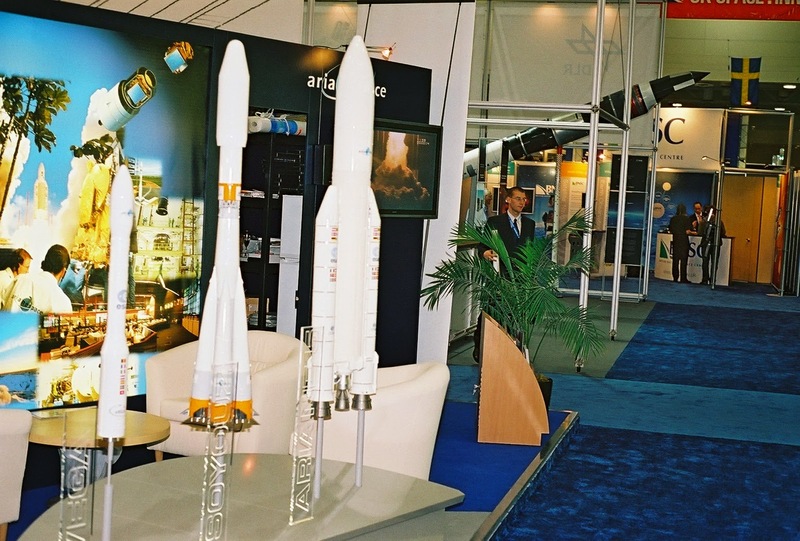 Commercial Displays at IAC 2004. Chris Gainor photos. Next week I will be in Toronto for the 65th International Astronautical Congress, the world's biggest annual meeting of people involved in the exploitation and exploration of space. This annual event first took place in Paris in 1950, and it has rotated around the world since then, taking place last year in Beijing and scheduled for next year in Jerusalem. 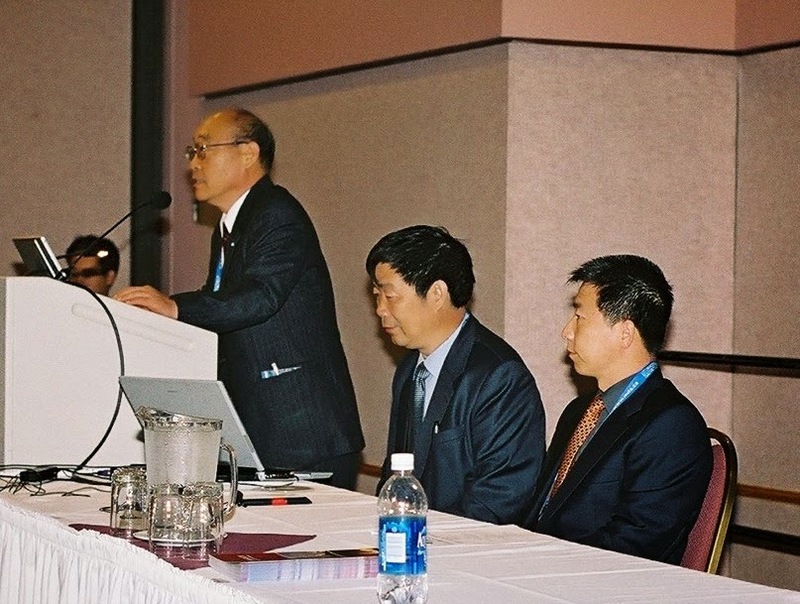 The meeting at the Metro Convention Centre, which goes from September 29 to October 3, is the third to take place in Canada - the IAC also took place in Montreal in 1991 and in Vancouver in 2004. These meetings draw thousands of delegates, including astronauts, leaders of space agencies, managers, engineers, scientists, business people, lawyers, and even historians like me. I took part in the Vancouver IAC ten years ago, and as the Toronto IAC approaches, I am reflecting on what has changed and not changed in space in the decade that has passed since the Vancouver meeting. That meeting opened on October 4, 2004, which was not only the 47th anniversary of the launch of Sputnik but an historic day for space in its own right. That day SpaceShipOne completed the set of flights to the edge of space that won it the $10 million Ansari X Prize, heralding a new era of private space flight. That news created expectations that the day when tourists would be able to fly on short suborbital flights to the fringes of space was only a couple of years off. A decade later, Virgin Galactic's SpaceShipTwo is still undergoing test flights and except for the handful of multi-millionaires who have been able to afford scarce seats on Soyuz spacecraft flying to International Space Station, the dream of space tourism remains on hold. No doubt this prolonged delay would have surprised those hopeful attendees at the Vancouver IAC in 2004. Although Virgin Galactic's work to establish suborbital space tourism has moved at a slower and more deliberate pace than had been expected, it has met no serious setbacks, and there are hopes that the first flight with tourists on board will happen in the next year or two. Other private space efforts have moved ahead in the past decade, usually with the help of governments. At IAC 2004, I picked up a t-shirt and cap promoting a then-new firm called SpaceX, which has since created the Falcon 9 rocket that has established itself as a new force in the space launch field, and the Dragon spacecraft that is already carrying supplies to the ISS. Although a recent SpaceX experimental launch failed, the fifth Dragon delivery mission to the ISS arrived at the station this week, and SpaceX won the go-ahead last week from NASA to build a spacecraft to ferry astronauts to the ISS. The firm has prospered to a large degree because of the Barack Obama administration's policy of supporting private space launch providers. The success of SpaceX relates to another event from 2004 - the George W. Bush administration's decisions to end the Space Shuttle program, which duly happened in 2011, and replace the shuttle with a new booster and spacecraft. The Bush administration's replacement program still exists as the Space Launch System and the Orion spacecraft, which are still years away from operational flight. These vehicles are competing with new rockets and spacecraft being created by SpaceX and other private sector providers supported by the Obama policy. China's first astronaut, Yang Liwei (right), appears but doesn't speak at the Vancouver IAC. Another big event at IAC 2004 related to China's space program. Late one day, word arrived that the next morning China's first astronaut, Yang Liwei, would make his first North American appearance at the IAC. Less than a year earlier, Yang had rocketed into space aboard the Shenzhou 5 spacecraft, serving notice that China was a rising space power. Even though most of the astronauts who attended the IAC attracted little notice, Yang's appearance caused near pandemonium. In spite of the short notice, one of the larger rooms in the Vancouver Convention Centre was packed at the announced time of Yang's appearance, and he got a standing ovation from the large crowd as soon as he arrived. Yang never spoke during the presentation about his flight, leaving all the talking to an official of the Chinese space agency. Cameras flashed throughout his appearance. I was scheduled to give a paper at the same time, but everyone, including me, wanted to see the world's newest space hero. So we adjourned our history session and I gave my paper later that morning once Yang had gone. Since then, China's human space program has moved at a deliberate pace. Four Shenzhou spacecraft with larger crews on board have followed Yang into orbit, the last two docking with China's first space station, Tiangong-1. China has also sent spacecraft to the Moon, most recently a robot that soft landed and then deployed a rover. But more controversially, China has also developed military capabilities in space, notably an anti-satellite weapon that was used destroy a satellite in 2007, creating a serious and ongoing space debris problem. Tense relations between China and the United States caused NASA to reduce its presence at last year's IAC in Beijing. Another 2004 event that reverberated at the Vancouver congress was NASA's successful landing of the Spirit and Opportunity rovers on Mars, signifying the resuscitation of NASA's Mars exploration program. Today Opportunity is still roaming the red planet, along with the larger Curiosity rover that landed two years ago. The Toronto congress takes place a few days after NASA's MAVEN spacecraft and India's Mars Orbital Mission were successfully inserted into orbit around Mars. The latter event has served notice that India has joined the ranks of the world's great space powers. As the world's space industry heads to the Toronto congress, all these issues from ten years ago are still active. As well, the Toronto meeting will take place under the shadow of the ongoing tensions arising out of Russia's attacks on Ukraine that have pitted Russia against the United States and other space powers, including Canada. Aside from some verbal threats, these tensions haven't yet affected the operations of the ISS. Like other spheres of economic activity, the space industry is emerging from the protracted economic troubles that got under way in 2008. Activity in space by private firms and government agencies took hits from the recession, and next week we will see how far the space industry has bounced back. What do historians of technology do? Many people may think that we simply track the parts that go into the machines that we use in our lives and the systems that make modern life what it is. Or that we look at the individuals who are associated with various technologies, such as Thomas Edison or Bill Gates. These topics are but a small part of our studies. The interaction of society and technology is a complicated one, and by studying this interaction we can learn a great deal about how technology and society evolve. In explaining why we study the evolution of technology, I often start off with seemingly simple questions: are the technologies we use determined by the physical qualities of the devices involved? Or do people determine how these devices develop and are used? An example I like to use when dealing with this question concerns stairs. 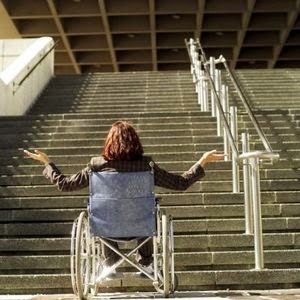 When I display a photo of stairs being confronted by a person in a wheelchair, no one needs to be told what the person in the wheelchair is thinking. The person is wondering why there are only stairs and not a way of moving up or down that accommodates their disability. Once buildings were equipped only with stairs, but today more buildings include other options such as ramps to help people get up and down regardless of their abilities. To put only stairs in a building was a conscious decision made by people, not something dictated by physics. And the fact that today buildings are routinely created to be accessible to all is a result of social change resulting from persons with disabilities and others advocating for this change. Historians of technology look at questions like this, and at the design and use of things like the automobile. Why do our cars have certain capabilities and not others? Why and how did the internal combustion engine become the primary power source? Why not steam engines or the electric car? It's much more complicated than the superiority of one type of engine over another. It involved people making certain choices and sometimes acting to close off other choices for a variety of reasons. In the matter of space exploration, we look at why it has progressed in the way it did. Why have humans gone to the Moon already? And why has no one gone back for more than four decades? The history of technology is a relatively new discipline. Some date it to 1958, when the Society for the History of Technology (SHOT) was formed, although it certainly goes back farther as part of the older discipline of the history of science. 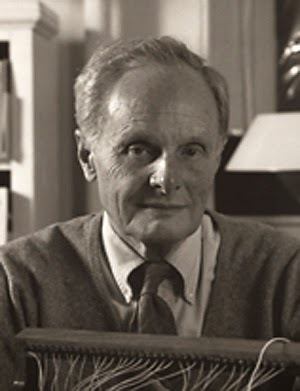 Earlier this year, we lost one of the great historians of technology and one whose writings influence my own work, Thomas Parke Hughes, who passed away in Virginia at the age of 90. Hughes is probably best known for his 1983 book, Networks of Power: Electrification in Western Society, 1880-1930, which compares how electrical power systems were set up in those years in Britain, Germany and the United States. While on the face of it, this is a dry subject, Hughes' account contained many insights about technology and the societies he covered in that book. For example, early British power systems were private, small and highly decentralized. During this time, Britons moving just a few blocks would have to deal with a different power system and a different power provider with their own voltages and plug designs. Perhaps it was just as well that they had far fewer appliances back then! Germany had more centralized power systems that moved easily from private to state control, and the U.S. has been served by large private providers who fought ferociously against public power. The Great War that started 100 years ago led to greater centralization of power systems in all these places. In that book, Hughes introduced ideas about phases in the development of technological systems, starting with invention and development, then technology transfer to and from other systems, followed by system growth and technological momentum as more people become dependent on a particular system. He also raised the idea of the technological reverse salient, where a system component does not progress along with other parts of the system in question, affecting the evolution of the whole system. In American Genesis: A Century of Innovation and Technological Enthusiasm in 1988, Hughes wrote about how American culture was shaped by technological change and widespread popular enthusiasm for new technologies. Two more recent works returned to technological systems. Rescuing Prometheus (1998) looked at the rise of systems engineering in the world of Cold War missile systems with the SAGE computer system and the Atlas missile, an area where I have done much of my historical work, and then its fall in large infrastructure projects in American cities, followed by its subsequent return in computer systems leading to the internet. In Human Built World in 2004, Hughes discussed the interfaces between society and technology, arguing for a seamless web between the human and technological realms. Hughes did not believe in technological determination and neither do I. But that doesn't mean that there isn't a complex interplay between technological systems and the societies they live in, with technologies affecting and being affected by political, social, and economic factors as well as their own physical properties. Historians of technology such as Thomas Hughes have given us many insights about how technology affects our lives, and how society and social forces have shaped the technologies that we increasingly depend upon in our lives. These insights help us anticipate what the technological changes of today and tomorrow may bring. RASC volunteers and telescopes at the DAO on September 6. Chris Gainor photo. The first summer of public outreach at the Dominion Astrophysical Observatory since last year's closure of the Centre of the Universe educational centre has gone in the books as a major success. Large crowds came out for Saturday night public observing at the DAO, and space camps held for young students were also well supported. Having said that, this year's public outreach was not trouble free, and a lot of work needs to be done in the coming months to ensure that public outreach continues on a more permanent basis. Last summer, the National Research Council of Canada, which runs the DAO, announced that the Centre and its public outreach work would close, although the DAO's research work would continue as it has for nearly 100 years. The Centre closed at the end of that summer. By then, the public in Greater Victoria had shown its concern about the NRC's action by signing petitions supporting the Centre, and large crowds came out for the Centre's final public events. In November, a meeting facilitated by Saanich South MLA Lana Popham brought people from the community and concerned groups together to begin the job of reconstituting public outreach at the DAO. The effort won support from the NRC, and for 2014, the Victoria Centre of the Royal Astronomical Society of Canada agreed to hold public observing nights at the DAO similar to what it had done before the Centre opened in 2001. The University of Victoria's Science Venture program agreed to hold space camps for children in Grades 3 to 8 at the Centre of the Universe building this summer. Science Venture is reported to be happy with the response to their space camps. This year's public observing at the DAO began on May 3, Astronomy Day. Unfortunately, the weather didn't cooperate, but more than 200 people came to the DAO anyway to tour the historic Plaskett Telescope. The story was similar when summer Saturday observing sessions resumed on July 5. After that, the weather was nearly perfect for most of the next six public observing sessions over the summer, with crowds usually exceeding 400 people for each session. Last Saturday, so many people turned up that traffic jams formed on West Saanich Road, and many people were turned back. Capacity for both people and cars at the observatory is limited, and this is a problem that will have to be addressed for next year. 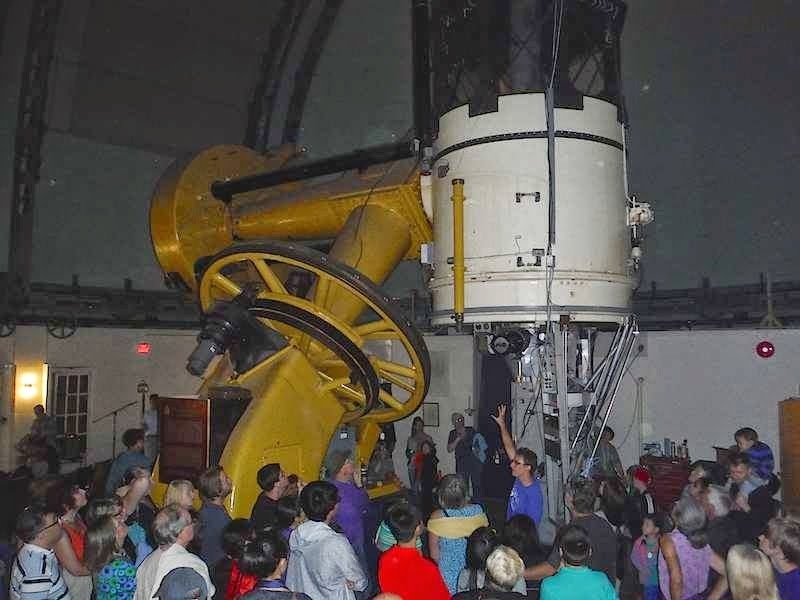 For each public observing night, RASC volunteers showed visitors planets, stars and other celestial objects through their own telescopes, while other volunteers conducted tours of the Plaskett Telescope, which in four years will celebrate the 100th anniversary of its opening. I helped out inside the Plaskett and had the privilege of working alongside telescope operator Dave Balam, who is one of the world's top experts on asteroids. Visitors to the first observing night in August got to meet CBC Quirks and Quarks host Bob McDonald, who received a certificate from Balam stating that an asteroid has been named after him. Lana Popham and her friends arranged for popcorn and hot chocolate for visitors to the DAO for last Saturday's summer finale. For observing nights next year and in the future, the RASC is thinking about ways to improve programming, perhaps with lectures about astronomy. The next step is to create a non-profit entity to operate the Centre of the Universe and outreach programs at the DAO. Don Moffatt, who spearheaded last year's petition to save the Centre, has set up a Friends of the DAO - Dominion Astrophysical Observatory group on Facebook, and everyone who is interested in keeping public outreach alive at the DAO is urged join this group. Before public activities return to the DAO next year, those of us involved in this year's successes hope to have news about the new entity and new public outreach activities on Observatory Hill. While there are many ideas being discussed for future years, we must keep in mind that the observing sessions were run by volunteers, and volunteer time is not an unlimited resource, and funds for new programs are scarce. Everyone mentioned above deserves thanks for all the hard work they did to make this summer's observing possible. I would like to give a special thanks to the NRC and its staff at the observatory for all their help. This year, the RASC Victoria Centre is celebrating its 100th anniversary. In June the Victoria Centre held a hugely successful General Assembly for RASC members from across Canada, something that also involved a major volunteer effort. Once that was over, Victoria Centre members pulled off this summer's observing nights. Kudos to all the RASC volunteers for creating a memorable centennial celebration! Visiting the historic Plaskett Telescope at the DAO, September 6. Sherry Buttnor photo. The Space Shuttle Simulator at the Museum of Flight in Seattle. Chris Gainor & Audrey McClellan photos. Three years ago, the U.S. Space Shuttle program came to an end after 135 flights to Earth orbit over thirty years starting in 1981. While NASA and private companies continue to develop new spacecraft to replace the shuttle, the artifacts of the shuttle program are moving into museums around the United States. The three remaining shuttles in the fleet went on display at the Kennedy Space Center at Cape Canaveral, the Smithsonian Institution's Udvar-Hazy Center just outside Washington, D.C., and the California Science Center in Los Angeles. Another shuttle used for flight tests but never flown in space is on display at the Intrepid Museum in New York City. More than twenty museums had bid for the shuttles, and one of the more prominent unsuccessful candidates for a shuttle was the Museum of Flight on the south side of Seattle, alongside the King County Airport at Boeing Field. As a consolation prize, the Museum of Flight got the full-scale shuttle simulator from the Johnson Space Center in Houston that every shuttle crew trained in as they prepared for their flights. On visits to Houston in the 1990s, I saw that the simulator was constantly in use. After the move to Seattle, this simulator opened to the public in November 2012 in the specially-built Charles Simonyi Space Gallery, named after the Microsoft Office creator who is the only person to have paid for two trips into space aboard a Soyuz spacecraft to the International Space Station (one of Simonyi's Soyuz capsules is also on show in the gallery). Seattle is close to my home in Victoria, and I recently had the chance to visit the Museum of Flight and the simulator. Inside the payload bay looking toward the cabin. The simulator includes the shuttle's payload bay, and visitors can a good sense of the shuttle's large dimensions from outside and from walking inside the payload bay, something that isn't possible with flown shuttles. Hanging above the payload bay are full-scale replicas of an Inertial Upper Stage, a Boeing rocket that was used to boost payloads from the shuttle's low Earth orbits to much higher orbits or into trajectories around the Sun, and a large scale model of the Hubble Space Telescope. For me, the highlight of the visit was a tour of the shuttle cabin, something that is available only on weekends and holidays and for extra cost. The cabin was where most of the work was done during this simulator's lifetime, and it bears the marks of more than 30 years of wear and tear. This is the reason the number of tours of the shuttle cabin are sharply restricted. But for anyone who wants to literally follow in the footsteps of the astronauts, the extra cost of this tour is well worth the price. The habitable space inside the shuttle consists of the flight deck and the mid deck, each about as big as a bathroom in an average house. The flight deck includes the cockpit where the commander and pilot sat during launch and re-entry, and a control panel at the back that includes controls for both the spacecraft and the Canadarm that moved payloads around the payload bay, which is visible out of two large windows. Visitors can't sit in the pilot and commander seats on the tour, but next to the simulator is a computerized cockpit mockup where visitors can try their hands at landing the shuttle. Back control panel on the flight deck. The Inertial Upper Stage is visible through the window. Directly below the flight deck is the mid deck, which is accessed by two ladders from the flight deck (unnecessary in space when one can float between the two levels) and the side hatch of the shuttle. The mid deck is lined with lockers containing gear for the flight, the compartment containing the shuttle toilet, and access to a tunnel leading to an airlock or the space station when the shuttle and station were docked, or to scientific modules that sometimes flew in the payload bay. The mid deck, which lacks windows, served as the sleeping station for shuttle crews, who used sleeping bags. The half-hour tour of the shuttle cabin gives one a good sense of the close quarters that crews had to deal with on shuttle missions that sometimes lasted longer than a fortnight. And these accommodations were roomy compared to the Mercury, Gemini and Apollo spacecraft that earlier astronauts flew, or even the Russian Soyuz ferries that today carry cosmonauts and astronauts to the ISS. In part because the United States has yet to settle on a new spacecraft to carry its astronauts into space, the shuttle still symbolizes America's space program to many people despite its retirement. The shuttle's place in history is still a matter of discussion and some controversy, something that is not addressed in this exhibit aside from information on the deaths of two crews on the shuttle. That being said, the shuttle simulator adds a great deal to the Museum of Flight's space exhibits. The museum is best known for its great collection of vintage aircraft, including Boeing airliners produced in the Seattle area, and aircraft from the First and Second World Wars. The museum also owns a Concorde supersonic transport, and one of the Boeing 707s that served as Air Force One in the 1960s, along with a Super Constellation decked out in the livery of Trans Canada Airlines, the predecessor of Air Canada. In part because Boeing was not as involved in early space programs and the shuttle as other contractors (some of which Boeing has absorbed in recent years), the Museum of Flight's space collection has been stronger on replicas than actual flown spacecraft. Visitors can see full-scale replicas of the Mercury spacecraft and the Apollo Command Module and Lunar Module ascent stage. As well, the museum has a full-scale replica of the Lunar Roving Vehicle, which was manufactured by Boeing, and the Destiny module from the ISS, which visitors can walk through, along with a many artifacts from the space program, including space suits and equipment used by the astronauts. For anyone who is interested in aircraft or spacecraft, the Museum of Flight is a must-see destination in the Pacific Northwest.